New – Choose the exact colors and finishes you want for your office workstations, so you can create a uniform look throughout your workplace. Remanufactured – Customize your cubicles with the panel fabric, laminate work surfaces, and paint of your choice, and receive cubicles that look like new, but at significantly reduced prices. Preowned – Receive your cubicles almost immediately thanks to our wide in-stock selection, and save thousands of dollars off the cost of new cubicles. 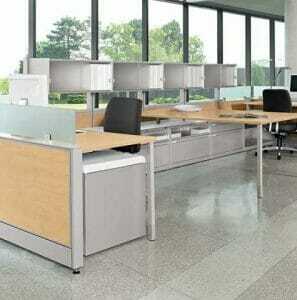 In addition to finding the ideal office workstations, you can benefit from our project management services as well. After a thorough consultation to discern your needs, we’ll design a cubicle layout that makes the most of your available office space. We’ll then deliver and install your new cubicles, going above and beyond every step of the way to ensure your complete satisfaction with your new furniture. To learn more about the many types of office workstations we offer to businesses in Houston, TX, contact Wells & Kimich today. We can even provide furniture rentals for those instances when you only need extra cubicles for a limited period of time.